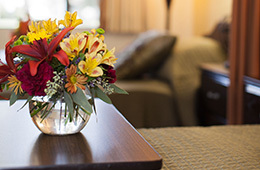 Linwood Meadows Care Center is a premier skilled nursing facility in Visalia, California. We serve those in need of rehabilitation or skilled nursing services while delivering compassionate care with an unrivaled expertise to everyone who enters our door. Our team of qualified professionals helps residents recover from surgery, injury or serious illness. They understand the importance of creating a comfortable and nurturing atmosphere, whether residents stay for short-term treatment or long-term care. At Linwood Meadows, our mission is to provide a home-like environment that embraces each person we serve. Our team of health professionals focuses on the physical, mental, social and spiritual needs of each resident. Because everyone requires a different level of attention, we thoroughly assess each individual to determine a customized rehabilitation plan that reflects each person’s abilities, needs, and desires. We invite you to stop by our Visalia location to experience firsthand the level of dedication and expertise each staff member possesses. One visit and you’ll know you’ve made the right choice. Call us to schedule a tour today. All 93 beds are Medicare and Medicaid certified.